In a show of support for the arts, a local business has been among the first to step forward with a donation to the Ararat Arts Precinct redevelopment. Ararat Rural City Council Mayor, Cr Paul Hooper with Ararat Medical Centre’s Dr Michael Connellan. Medical Centre Partner Dr Michael Connellan said he and his four business partners were keen supporters of the Ararat community.Ararat Medical Centre recently announced it would contribute $2000 to a community bid to raise $100,000 for the project. “We all live and work in Ararat Rural City and want to see the region thrive,” Dr Connellan said. Dr Connellan said the partners were also avid supporters of the arts, with Dr Derek Pope and his wife, Jan, actively involved in various theatrical groups within Ararat. 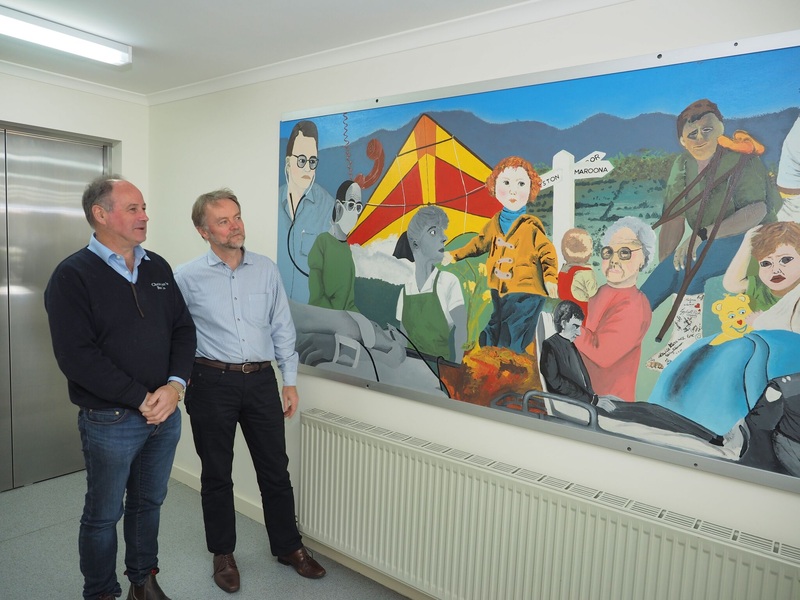 “We also saw this donation as a way of building on the work by long-serving GP and artist, Dr Graeme Bertuch, who was a passionate supporter of the arts locally,” Dr Connellan said. Ararat Medical Centre was established in the early 1960s and is the only locally-owned General Practice servicing the regional community and hospital. Today, its walls are adorned with a number of artworks created by Dr Bertuch, his wife, Carolyn Thomas, and other artists from across the region. “Aside from our genuine interest in the arts, we also believe the arts precinct upgrade will help to build tourism and will attract new activities and entertainment for residents and families to enjoy,” Dr Connellan said. “Being able to enjoy the new facilities and attend events in a modern facility in our home town will be exciting! The $7.735 million redevelopment is now underway, with works expected to be completed in the first quarter of 2018. It has been funded in a joint partnership between the Ararat Rural City Council, and state and federal governments, with a requirement that the community raise $100,000 towards the project. Ararat Regional Gallery Director Anthony Camm said tax deductible donations to support the project could be made by presenting a cheque made out to Ararat Regional Art Gallery. Alternatively, individuals, businesses or groups could phone Kylee Whiting on 5352 2836 (Thursdays or Fridays) or email kwhiting@ararat.vic.gov.au to arrange an EFTPOS payment. Mr Camm said donations of $500 or more would be recognised on a permanent donors’ board displayed within the arts precinct.